Trust, in case you hadn’t noticed, has gotten “hot” lately. But much of it sounds very vague—soft, fluffy, nice-to-have, the buzzword du jour. I’d like to do my part to make it real. To me, that means breaking it down and making it sound; tapping into the strategy and mysticism, but also staying grounded in the tactical and the practical. So let’s review some context; then talk about four specific operating principles a business can hone in on to improve its trustworthiness. I’ve suggested elsewhere that “trust” is too vague a term to work with. To do something practical, we need first to identify the trust realm: are we talking about personal trust, or business/organizational trust, or social/institutional trust? The next question is about the trust role: are we working on being more trusting? Or more trustworthy? They are not the same thing. And “trust” is the result of them both interacting. In the realm “personal” and the role “trustworthy,” we can point to personal beliefs and behaviors as indicated in the Trust Quotient. 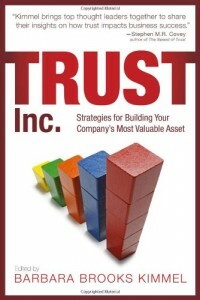 But in business, trustworthiness is built through a set of daily operating principles. Trustworthiness is built from habitually behaving in accordance with a set of commonly shared beliefs about how to do business. I suggest they can be boiled down to four. 1. A focus on the Other (client, customer, internal co-worker, boss, partner, subordinate) for the Other’s sake, not just as a means to one’s own ends. We often hear “client-focus,” or “customer-centric.” But these are terms all-too-often framed in terms of economic benefit to the person trying to be trusted. 2. A collaborative approach to relationships. Collaboration here means a willingness to work together, creating both joint goals and joint approaches to getting there. 3. A medium to long term relationship perspective, not a short-term transactional focus. Focus on relationships nurtures transactions; but focus on transactions chokes off relationships. The most profitable relationships for both parties are those where multiple transactions over time are assumed in the approach to each transaction. 4. A habit of being transparent in all one’s dealings. Transparency has the great virtue of helping recall who said what to whom. It also increases credibility, and lowers self-orientation, by its willingness to keep no secrets. What are the tools an organization has at its disposal to make itself more trustworthy? Any good change management consultant can rattle off the usual suspects, but for trustworthiness, the emphasis has to shift somewhat. The usual change mantra includes a heavy dose of behaviors, metrics and incentives. Some of that works here, but only to a point. For example, Principle 1, focus on the Other, is contradicted by too much extrinsic incentive aimed at leveraging self-interest–it undercuts focus on the Other. And Principle 3, relationship over transaction, forces metrics and rewards to a far longer timeframe than most change efforts employ. Another great shibboleth of change is that it must be led from the CEO’s office. But with trust, it ain’t necessarily so. Trustworthiness is a great candidate for infectious disease change strategies; guerrilla trust strategies can work at the individual level, and individual players can lead. Behavior in accord with these principles cannot be coerced; the flipside is, it can be unilaterally engaged in. The most powerful tools to create a trustworthy organization are things like language, recognition, story-telling, simply paying attention to the arenas where the principles apply—and the will to apply them. Role-modeling helps; some skill-building helps. But most of all, it is the willingness to notice the pervasive opportunities to work in accordance with this simple set of four principles. Trustworthiness breeds trusting (the reverse is true too); the combination is what leads to trust. Which, by the way, is quite measurable in its impact on the bottom line.